The month of March was an active month for sage grouse. Not only have sage grouse started to assemble on their strutting grounds known as leks due to the abnormally warm start of the month but the season for strutting has begun Washington D.C. and Boise, Idaho and other areas in western states. On March 1st a flurry of activity that politically undermines protections for sage grouse and grazing reform in the Owyhees started behind the scenes once the Owyhee BLM office released its decision to cut grazing on the so-called Owyhee Group 1 allotments. There have been attempts by many to undermine science, the law, and influence public opinion about sage grouse. Part of the strategy seems to be to make the BLM decision to reduce grazing on the Group 1 allotments appear radical. Another part of the strategy is to make the industry written state sage grouse plans look like they are science based alternatives that will protect sage grouse over the long term. Neither of these assertions are true. Political interference isn’t new and this whole process has been conducted solely to insulate public lands ranchers from any accountability for the devastation they have wrought on the landscape. In some instances the concern for sage grouse has actually been co-opted to benefit public lands ranchers. Rarely is there any discussion about the condition of the landscape or concern for sage grouse or other species that depend on healthy landscapes. I’ll try to explain the latest round of political interference. On March 1st the Owyhee Initiative wrote a letter to the State office of the BLM. The Owyhee Initiative, a collaborative group that was set up to exclude Western Watersheds Project and others who were working hard to gain protections for the Owyhees and reduce the abusive grazing that has destroyed so much of the landscape and so many miles of streams, consists of several groups representing moderate conservation groups who want wilderness, Owyhee County, livestock interests, and others. The letter expressed unelaborated concerns about how the Group 1 proposed decisions might affect the goal of the Owyhee Initiative. We are concerned that implementation of the proposed grazing decisions may preclude opportunities to develop more collaborative solutions for meeting Idaho’s standards and guidelines for rangeland health while keeping rural economies healthy and resilient. Frankly, the BLM has taken public comment from the beginning of the process and clearly the landscape is suffering severe degradation from decades of abusive livestock grazing. This letter appears to place the ideal of collaboration over the condition of the landscape. It is a clear attempt to undermine the process and buffer livestock interests from cuts in grazing using the cover of moderate conservation groups to give the appearance of legitimacy. NRCS withdraws as a cooperating agency from the decision making process to make the BLM decision look extreme. On the very same day as the Owyhee Initiative sent their letter to the State BLM office the Natural Resources Conservation Service (NRCS) sent a letter withdrawing as a cooperating agency from any further decision making on the Owyhee allotments. The NRCS has long played a roll as an agency dedicated to ranching interests. Their ecological site descriptions are the basis for determining whether landscapes are meeting standards for rangeland health or not. They also provide funding for vegetation treatments, rangeland “improvements” such as water pipelines, troughs, and fencing through the EQIP program. The Wildlife News has outlined some of the ways that NRCS has fundamentally corrupted their ecological site descriptions to portray conditions as those desired by livestock interests rather than conditions that match up to historical conditions here and here. Their ecological site descriptions for Juniper Mountain don’t describe junipers as an expected part of the vegetation community despite the fact that the mountain is covered with a climax, old growth juniper forest. Because the BLM wasn’t proposing to build more range “improvements” to address the severe degradation of the landscape, and because the agency values the interests of livestock producers over the condition of the landscape, the NRCS withdrew as a cooperating agency. Of course the agency is still willing to lend a hand when the BLM wants cover of its bogus ecological site descriptions. A prominent newspaper writes sympathetically and unquestionably about ranchers. The Idaho Statesman has published two articles in recent months talking about the intersection of grazing and sage grouse in the Owyhees. The first article, published on January 28, starts out with how mad one Owyhee County rancher, who isn’t even affected, is about the cuts announced for the Group 1 allotments. The article barely mentions the sorry state of the landscape on those allotments. Instead, it focusses on the economic impacts and falsely claims that “[r]anching is a major part of the economy.” The article claims that the decision will have a huge impact on the Owyhee County livestock industry, an industry that is immensely successful at exerting political influence and wildly exaggerating its economic impact. The article also claims that the cuts “threaten the collaborative Owyhee Initiative that was formed by the county by bringing ranchers together with groups such as the Idaho Conservation League, the Nature Conservancy, the Sierra Club and Idaho Rivers United” as if the collaborative is more important than the law and the condition of the landscape. The second article, by the same author, writes about how Idaho Senator Jim Risch (R) asked the nominee for Secretary of Interior, Sally Jewel, to review the BLM decision to cut grazing on the Group 1 allotments if she is confirmed as Secretary. It then mentions the Owyhee Initiative letter expressing concerns over the decision and NRCS’s decision to drop out as a cooperating agency. Both of these articles focus on the concept of collaboration as if it has magical properties that result only in happiness and joy. It is a common theme expressed by this author whenever writing about conflicts over environmental issues. The problem with collaboration, at least the style of collaboration practiced in western states, is that it is often exclusionary and is used by industry groups as a way to bypass the law’s requirement to use the best available science in making decisions. The western style of collaboration is a corruption of what could be an inclusive and science influenced process. Owyhee County asks for changes in the Standards and Guidelines for Rangeland Health. While I agree that there are significant problems with the ISG I think that I have a different idea of what the results of such a review should be. It is clear that there is a lot of ambiguity in the ISG, but that is intentional because Idaho ranchers have been resisting any measurable standards for livestock grazing. If there were measurable standards, which the commissioners complain about the lack thereof, it is unlikely that most places could ever meet them. Furthermore, when measurements are taken, they are taken in areas that have very little impact from livestock grazing. I think they are hoping to further weaken, not strengthen, any standards. As it is, the ISG are based on the corrupted ecological site descriptions of the NRCS. Governor sends a letter asking for the BLM and Forest Service to violate federal law. On March 14 Governor Otter sent a letter to Brian Kelly, the state director of the US Fish and Wildlife Service, requesting that the USFWS concur that Idaho’s plan contains the adequate regulatory mechanisms that would prevent sage grouse from being listed as an endangered species. While the USFS and BLM are updating their land management plans to address sage grouse they are required by the National Environmental Policy Act (NEPA) to consider a wide range of alternatives. Instead, by asking the USFWS to concur with Idaho’s plan, the governor is asking that Idaho’s plan be the only plan to be considered for Idaho. This clearly violates NEPA as well as FLPMA and NFMA the laws that regulate BLM and USFS lands respectively. The state plans of Idaho and Wyoming, and soon Utah, were written by primarily industry groups who wanted to see the least amount of lands protections. The process for each state was exclusionary from the very beginning and only the “good” conservation groups were asked to participate. 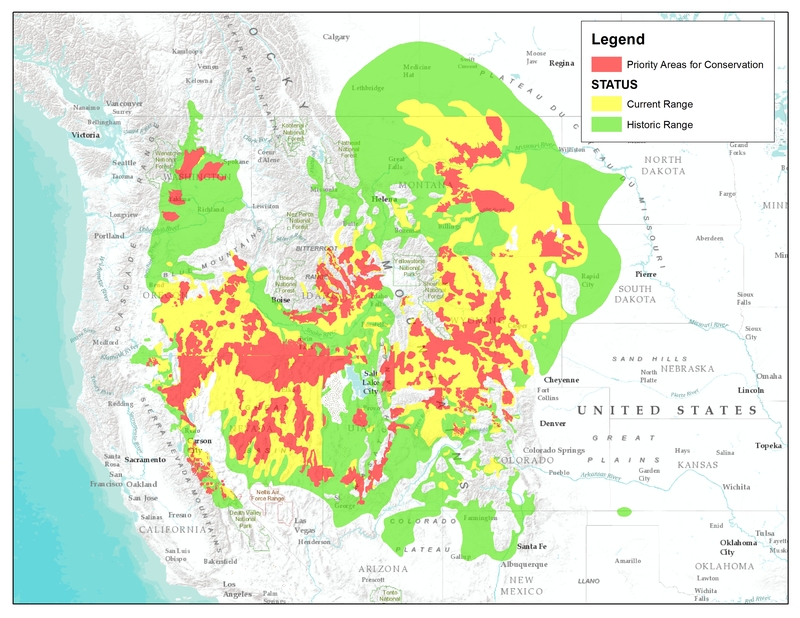 The Idaho and Wyoming plans played fast and loose with science and refused to acknowledge the role that livestock grazing has played in the rapid decline of habitat degradation and the role that livestock grazing has played in an increase in fire frequency through degradation of soil crusts which protect landscapes from cheatgrass invasion which, in turn, increases fire frequency. Many of the team members who wrote the plans advocate for increased grazing to reduce fire risk even though the opposite effect is occurring now. The plans also ignore the negative role that non-native crested wheatgrass has on sage grouse habitat because livestock interests have promoted seeding of this grass for decades. USFWS concurs with neutered state alternatives for sage grouse. On March 22 the USFWS issued the Greater Sage Grouse Conservation Objectives Team report or COT Report. The report is a “collaborative approach” between the USFWS and each state within the range of the greater sage grouse. Essentially the report identifies “Priority Areas for Conservation” (PAC’s). Instead of protecting the large blocks of unfragmented habitat that sage grouse need these PAC’s reflect drastic reductions in habitat for sage grouse and look more like they were drawn by Political Action Committees representing industry rather than biologists. The first name on the team member list is rancher, and former executive director of the Wyoming Stock Growers Association, Bob Budd from Wyoming who has championed the development of state core area strategy plans that have cut away big areas from any protections so that industry can have its way with the land. In Wyoming we are already seeing how inept their plan is after the state of Wyoming and the BLM approved the Lost Creek Uranium mine in so-called core habitat and allowing roads to be built within 6 tenths of a mile from active leks and allow 100 well heads per square mile when the standard set is just one. The Department of Justice, after the BLM was sued by the Biodiversity Conservation Alliance (BCA) over the failure, argued in court that the Wyoming plan is voluntary. Eric Molvar of BCA explains these shortcomings quite well in this editorial in the Wyoming Star Tribune. Another team member, John Harja of Utah, has been instrumental in filing RS2477 road claims against the federal government Utah. The Utah sage grouse plan, yet to be finalized, appears to be taking the same approach as the Wyoming and Idaho plans which drastically reduce sage grouse habitats. The team members who are writing the plan are mostly industry types who don’t want any protections just like in Idaho and Wyoming. Another weakness in the state plans, and the COT report itself, is that they rely heavily on papers by Garton and Doherty which claim that populations are stable. These papers were based on data that was up to date at the time but since 2007 there have been several very large fires in Idaho, Nevada, and Oregon. There has also been oil and gas development in Wyoming and northwest Colorado. This reliance on old data gives a false sense of security that is used as justification to eliminate habitat that has seen steep declines in sage grouse over recent years. Additionally, entire populations are written off in Idaho. For example, the population in Eastern Idaho between Pocatello and Idaho Falls, and the population near Cambridge have been entirely written off. These populations, because of their isolation from larger populations, are vulnerable to extirpation and other species, such as sharp tailed grouse, that would benefit from habitat preservation there will likely be at risk because much of the Conservation Reserve Program lands are grazed now. In Nevada, after Governor Sandoval fired Ken Mayer as director of the Nevada Department of Wildlife (NDOW,) few employees are speaking out when they see livestock turned out in places where there is severe drought. Projects that are clearly damaging to sage grouse that have been approved by the BLM receive little questioning input from NDOW and go totally unopposed unless people paying close attention start complaining such as Western Watersheds Project. In Idaho, the same dynamic has been at play for years. Idaho Fish and Game employees have increasingly bowed to political pressure or have been demoted for speaking out. The IDFG used to provide input into various BLM and USFS proposals but that has been drastically cut back due to political pressure. Will there be any pushback by conservation scientists or will they sit back and just document the extinction of sage grouse? That seems doubtful in this political climate where biologists are used only to give some air of legitimacy to industry derived plans. Congress starts sticking its nose into the process. Presumably the next step will be to force the USFS and BLM to only consider the state alternatives when revising the land use plans for the affected forests and BLM districts. This would be an obvious violation of law, as mentioned before, that would easily be challenged in court when, and if, the USFWS finds that sage grouse are again warranted but precluded or not warranted for protection under the Endangered Species Act. Clearly the state plans, with their voluntary protections, are not adequate regulatory mechanisms that will protect sage grouse. They also aren’t based on the best available science as required by law. How will the USFS and BLM be forced to consider only the state alternatives? Well, there has been activity in the US Congress by Senator Patty Murray (D-Washington), Senator Dean Heller (R-Nevada), Senator Harry Reid (D-Nevada), Senator Jim Risch (R-Idaho), Senator Mike Crapo (R-Idaho) Representative Mike Simpson (R-Idaho) to push the agencies to work with the states on sage grouse. Recently a rider was attached to the Fiscal Year 2014 Budget that “assures collaboration in sage grouse recovery”. Presumably this is just the first effort to bypass ESA protection by the congress, will this result in another legislative bypass of the Endangered Species Act like happened with wolves? This is uncertain but clearly there are some who would have no qualms about this. All of this orchestration is to undermine science and the BLM. Previous articles about this issue on The Wildlife News. Biodiversity Conservation Alliance also has a good article about the Wyoming Core Area Strategy in their Spring 2011 newsletter. If any of this process has caused physical harm to the people who live in the area,who have to drink the water,their is a way to start a movement to block the Blm. But they would have to find medical reasons and a doctor or doctors to write notes,that this water is causing harm to the people who live in the area.That is always one way to stop the government in their tracks,it’s a lot of work but worth it. Or finding dead animals caused by the change that the cattle has made. I read the “letter”, first time I heard of SIDRA. 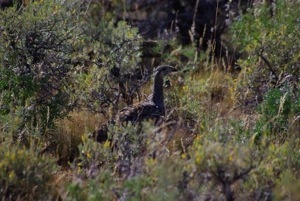 Their race through the sage brush especially during nesting season has got to be a real jolt to all ground nesting birds. Can’t that be stopped? I would add, it is so “logical” in the name of science to have an outfit like SIDRA on the Board of Directors, Owyhee Initiative. I admit it does fit with some of the big hat groups but what is TWS, Sierra and ICL doing on the initiative. Doesn’t that give it a false sense of legitimacy? Shame on them! Outdoor idaho on the owyhee initative right now. Looks like a rerun but probably worth watching.